learning is fun and the visit always too short! Learning is fun at Hibernia KidsPlace. It’s a kid’s world, with plenty of chances to experience the wonder and excitement of planet Earth, both past and present. Specially designed for little ones seven years of age and younger, Hibernia KidsPlace features hands-on activities designed to inspire active young minds. They’ll have fun, but they’ll also be learning and stretching their imaginations. The only thing you’ll want to change is that KidsPlace is not open to all ages! 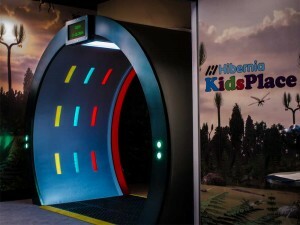 The all-new and all-amazing Hibernia KidsPlace is just one of our 14 Unique Attractions! 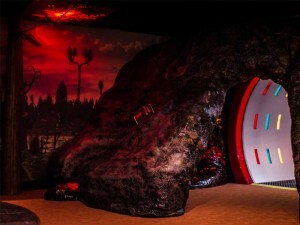 Travel through our Time Tunnel into our volcano and enter a land with giant prehistoric bugs. Climb into our oil rig and then slide down to check out what’s underneath! Travel to Moon Base GEO and try your hand at the glove boxes or create your own space creature. Design and build whatever you can imagine. Get creative with art and colouring. Kids must be accompanied by an adult, but don’t worry… we’re sure you’ll have fun too! This program was made possible through the support of the Hibernia Management and Development Company Ltd.